With the entire 10 songs on Reign In Blood clocking in at just shy of 30 minutes; when the album was released people who bought the cassette were pissed off that all the songs were repeated on the 2nd side. Then they played the fucker! Motley Crue‘s album Theater Of Pain bore a sticker that proclaimed the album contained sonic fury, Slayer‘s Reign In Blood bore no such sticker. Unlike Motley Crue‘s release, which contained mediocre drivel, Reign In Blood does actually contain sonic fury. We were blown away by the albums ferociousness and everyone who heard Reign In Blood could not deny that Slayer was a true ThrashMetal band. Now days, Reign In Blood is considered an extreme classic and many go so far as to say it is the pinnacle of what a true ThrashMetal album should be. It is timeless. Listening to it today, it is still as heavy, if not heavier, than anything out there. 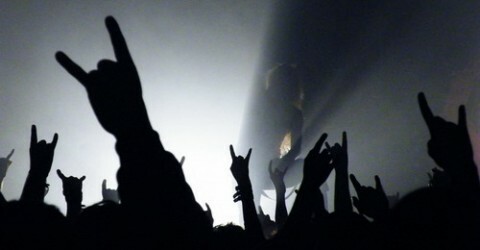 Musically, the songs are short bursts of aggression with relentless drum kicking by Dave Lombardo driving the guitars of Jeff Hanneman and Kerry King, which sound more like cats either copulating or being strangled than they do guitars, and Tom Araya‘s guttural screams and spitting vocals to lyrics of death, evil, and torment… (sighs) It’s like dying and going to a very dark and blistering version of heaven. Most MetalHeads know this album and those who do not like ThrashMetal cite it as one album even they will listen to. See, for all their speed, aggression and ferocity, Slayer are a band of accomplished musicians who know their way around their instruments and how to put a song together. 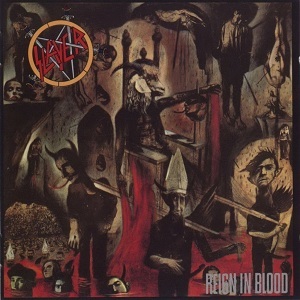 Many bands cite Slayer, and especially the album Reign In Blood, as being a major influence on their song writing. Their have been many Thrash releases since Reign In Blood and not one of them comes close to being what this album is, not even Slayer‘s own releases. What starts out with a wailing scream and ends with the sound of blood dripping from the heaven’s is one hell of a relentless album. If you have not heard this album, you owe it to yourself – listen to it.